TSG Network proudly presents: our brand new infographic on results 2014-2017. Since 2014, the Traffic Snake Game has taken place in 19 countries. So far, the impressive amount of 177.587 pupils in 1.192 schools played the game. 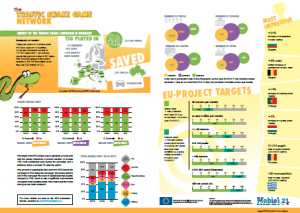 The EU-wide savings in this period reached 2.458.853 kilometres of car trips and 397 tonnes of CO2. The target of the TSG project was to generate a modal shift with the (travel) behaviour of school children, of at least 15% more sustainable trips during the campaign and a retention effect of at least 7% after the action. The actual amount of sustainable trips so far went from 63% before the campaign to 78% during the campaign (multiple years and multiple countries combined). Three weeks after the end of the campaign the share of sustainable trips slightly dropped to 76%. This means our modal shift targets have been achieved! What is more, this shows how much can be done by focussing on people, and how behaviour can change through campaigns. The Traffic Snake Game campaign shows how “soft” measures can promote sustainable transport and manage the demand for car use for home-school traffic. In order to make long-term changes, policy makers at all levels need to provide the necessary conditions to cultivate and harvest this modal shift. People are willing to change behaviour already. Imagine what better infrastructure and better services for walking, cycling and public transport could do in your neighbourhood, municipality, city, region, country,… When these “hard” measures and “soft” measures go hand in hand, they enhance each other. A less car-dependent lifestyle is not a dream, it is a choice! Please find more details in our latest infographic. You can also watch a 4 minute summary animated video at the results page. United Kingdom, WYG (Environment Planning Transport) Ltd.